This part of the west side of Bath Street takes in the section from Spring Lane to the bottom of the road. Then we come to the small shops against the Primitive Methodist Chapel. These shops were very seldom let, as most of the business at that time was done in the upper part of Bath Street. If you look on the 1871 Ilkeston census you will find, at this point, a couple of lock-up shops, before the grocery premises of Sarah Orchard (nee Whitfield), the widow of Henry Martin Orchard, master grocer. Boarding with her is Thomas Tanfield, Primitive Methodist Minister — not far to walk to work ?!! The old Primitive Methodist Chapel was in Chapel Street. I believe it has been converted into a dwelling house. When we lived in the old house in Bath Street (now a cinema is on the site), and my maternal grandmother paid us a visit, she went to that chapel. It was not far from our house, and as she was lame, that was a consideration. I always accompanied her on these occasions, and I have heard her say that she enjoyed the services. On the map you can just see the Bath Street end of Chapel Street at the top, on the right. The Primitive Methodist Movement …. ……developed in the early years of the nineteenth century, born out of a dispute within the Wesleyan Methodist church. Hugh Bourne and William Clowes were two Wesleyans who offended the Establishment members of their church movement with their fervent evangelicalism. About 1800 Hugh, a native of Bucknall, Stoke-on-Trent, had travelled several miles north up to the area of Harriseahead and Mow Cop on the Staffordshire-Cheshire border and was quite shocked by what he found there. “There was not in England a neighbourhood that was more ungodly and profane. A stranger could hardly go over Harriseahead without insult and sometimes not without injury” was his less than charitable judgement of the area. He began a series of meetings in the area to fan the flames of religious revival. Initially these were prayer and Bible study meetings, but with his friend William Clowes, Hugh held ‘Camp-Meetings’……. American-style, all-day, open-air prayer and preacher meetings which were anathema to the Methodist authorities who regarding them as “highly improper and likely to be of considerable mischief”. Having been issued with several warnings which they chose to ignore, firstly Hugh and then William were by 1810 expelled from the Methodist Church. Not dispirited, they set up their own society. A chapel was built at Tunstall, Staffordshire in 1811 and soon the Primitive Methodist Church was founded. “I still remain a primitive Methodist”….primitive meaning ‘early’ or ‘original’ and not ‘undeveloped’ — these evangelists were reviving John Wesley’s original ways. The people who attended (the chapel) in those days were called Ranters, because of their fervour, but now they are treated with more respect. Adeline’s ‘Ranters’ were originally followers of Hugh Bourne but later the term was applied more generally to members of the Church who would wave their arms and stamp their feet in chapel, raise their voices in prayer, and parade through the streets, singing hymns. An article in the Ilkeston Advertiser (1916) celebrating the centenary of the Primitive Methodist Church in Ilkeston, and other articles from the same newspaper 50 years later, mention the following events in the story of Primitive Methodism in Ilkeston, to which a little more detail has been added. 1] In 1811, aged 17, Sarah Kirkland of Mercaston, Derbyshire was so impressed by a group of ‘Ranters’ that she decided to devote her life to the Lord and within two years she was accepted into the movement as a preacher, its first female travelling preacher. Unlike the Wesleyan Methodists of this time, the ‘Prims’ encouraged women evangelists. It is said that Sarah’s first convert was a gypsy boy at Sutton-on-the-Hill, a few miles west of Derby, who thereafter made it his task to travel with her, and announce Sarah’s arrival in every town and village that she might visit. And one place that she did visit in August 1816 was Ilkeston. What would the young ex-gypsy have made of the people as he led Sarah and her band of ‘Ranters‘ into the town? And what would they have made of him? Many of the population, hardened miners and their families, were not reluctant to share handfuls of filth and mouthfuls of foul language with strangers. 2] George Herod was another pioneer of the church in the area and its first home missionary. He reported on Ilkeston thus; “The condition of the people as to roughness and rudeness is like that of the natives of Mow Cop in 1800 before the first Revival” — not a compliment !! 3] It seems however that these early evangelists achieved some success. In 1817 a room in a house in Florence Square, off Wood Street, was acting as the first meeting place of the Primitive Methodists in Ilkeston although worshippers ‘were subjected to great annoyance from the lower order of the inhabitants’. The room continued in use until the ‘Prims’ moved to their Old Slade Chapel in Chapel Street. Mr Herod was pleasantly impressed by the advances made. “Few places within the same time have made greater progress morally and intellectually than Ilkeston”. 4] After Ilkeston, Sarah Kirkland moved on to Cotmanhay with the same results. In the early 1820’s regular services were held in the houses of Job Fretwell at Cotmanhay and Hannah Wheatley at Shipley. Probably because these premises were proving too small, services moved to a barn belonging to the Ancient Druids Inn, a forerunner of the Methodist Chapel, at the corner of Bridge Street and Cotmanhay Road. 5] It was at this time that the ‘Old Slade Chapel’ was built in Chapel Street. Bagshaw’s Directory of 1846 dates the chapel opening to 1823 with galleries erected in 1831. Other sources (e.g. Moorley) put the chapel building (incorrectly) ten years later, about 1833/4. Its building was financed by public subscription and stood on the southern side of Chapel Street at its junction with Burr Lane. 6] Ilkeston was part of the Nottingham First Circuit and its branch included the chapels at Ilkeston, Shipley Wood, New Stapleford, Beggarlee, Cotmanhay and Awsworth. By 1850 the ‘Prims’ had a recorded national membership of 104,762, with 519 travelling preachers, 8524 local preachers and 5170 chapels. The chapel had no regular school-rooms so that the 300 scholars who attended the Sunday school had to be instructed in the chapel itself or upon adjacent ground. The ‘anxious wish’ for replacement premises was manifest .. what held back this desire for becoming reality was the inability to procure the land for a building. The same 1851 Census records 1823 and 1824 as the building date for the Slade Chapel with accommodation for 330 people. Its Sunday morning attendance was 60 and the Sunday School numbered 105, while the afternoon School figure was 190 and the evening congregation was 300. This information was supplied by the chapel steward, John Robinson of Bath Street, mining agent to the Butterley Company. 9] In early 1850 negotiations were entered into with the Duke of Rutland with a view to the Methodists purchasing a plot of his land in Bath Street, land which was eventually bought in April 1852. 10] On New Year’s Day of 1852 a large tea-meeting was organised by the Rev. Carthy, at the British School, to raise funds for the building of the new chapel. After the tea, two simultaneous public meetings were held at the School and at the old Chapel at which an estimated 700-800 people attended. As a result of the enterprise and work of the Rev. William Carthy, Circuit superintendent minister from 1848 to 1853, the new Primitive Methodist Chapel in Bath Street was built in 1852, at a cost of £1,300. 12] White’s Directory of 1859 describes the new chapel as a ‘good brick building, capable of seating 600 hearers, to which are attached excellent school rooms for the Sunday scholars’. 13] William Carthy was born at Alrewas, Staffordshire in 1805, became a local preacher in 1827 and a minister two years later. He was never a favourite with the Pioneer but at his death in October 1861 the newspaper described him as one of the most laborious and persevering ministers ever stationed at Ilkeston, with ready tact and ingenuity, undaunted by opposition (which he was never short of ! ), tireless and hardworking. In chapel building he had few equals, not only overseeing the building of the Ilkeston chapel but also those at Cotmanhay, Langley Mill, Cinderhill, Taghill and Old Basford. After a funeral service at Ilkeston his body was conveyed by train to the General Cemetery at Nottingham, accompanied by about 70 members of his congregation. 15] In July 1866 William Clayton arrived from Grantham, Lincolnshire, as Superintendent of the Ilkeston Circuit. At the end of the decade he and his family departed for Clay Cross. 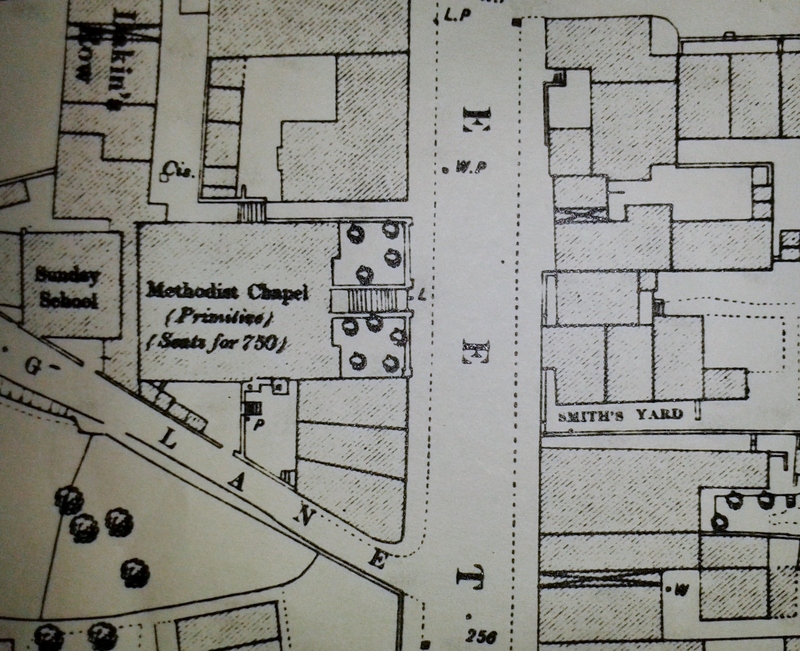 16] By 1888 Sunday School rooms and cottages had been built in Spring Lane — later Wilmot Street. Bourne Cottages in the recent past … courtesy of Jim Beardsley …. pre Sky dishes, UPVC, and re-tiling. 17] In July 1899 the memorial stone of the new manse for the chapel was laid in Lord Haddon Road, by George Woolliscroft, son of Charles (absent through illness). It was to be called Cromwell House. On Sunday morning, September 5th 1920, Mary Ann Keeling (nee Aldred), wife of grocer Stephen, died at her home at 13 Pelham Street, aged 88. 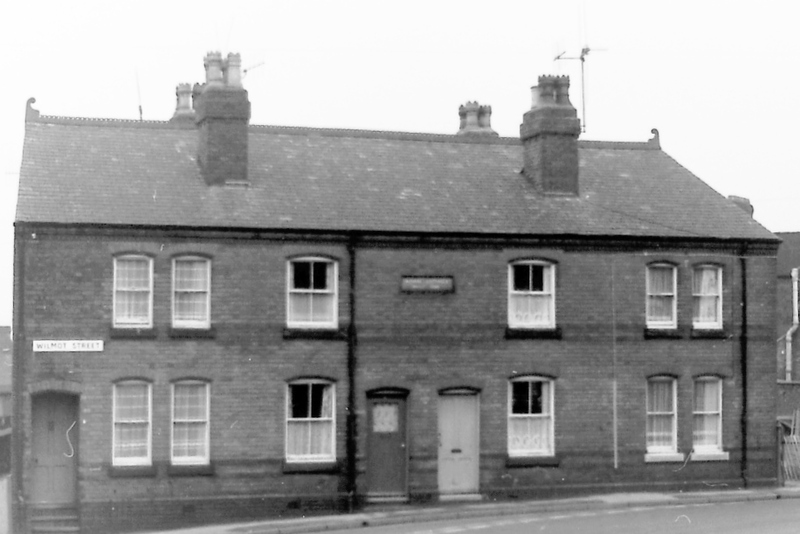 She had been a member of the Primitive Methodist Church since it had been built in Bath Street in 1852 and it was reported that she was the last Ilkestonian to have also been a member of the previous Slade Chapel in Chapel Street. Lower down the street were two or three cottages, built back from the road, on top of the original bank. Here Adeline is possibly referring to Daykin’s (or Dakin’s) Row, deriving its name from occupant John Daykin, a lace agent. Born in 1804 John was the son of framework knitter and Chelsea Pensioner Joseph and Ann (nee Briggs), and a cousin of Richard Daykin (who we met earlier in South Street). In the summer of 1854 there was a spate of ‘garden robberies’ at various places in town and one victim was the lace agent of Bath Street. In June he lost from his garden a score of his best cabbages, a whole bed of shallots and a crop of onions; John was determined to catch the culprits or at least give it a try. Consequently on the Friday night following his loss, he positioned himself, carefully hidden and as comfortable as he could, in a cart in the garden. And then waited !! The vigil did not last the whole night however — it started to rain so heavily that John decided to retire indoors and into his bedroom, overlooking the garden. Just about to get into bed, a noise from the garden alerted him to the possibility that the robbers had returned for more loot. Armed with hedge-cutters the intrepid lace-man descended to the garden and confrontedthree thieves, all well-known to John. One of them resisted the attempts to apprehend them and, in the scuffle which followed, lost part of a finger — chopped off by the cutters. The wounded fellow was taken indoors by John who bound the injury and then succumbed to the repentance tears, prayers and promises of the prisoners — he consented to free all of them and ‘give them another chance to amend their manner of living‘ … or to attack someone else’s garden !?! John died in Daykin’s Row on June 23rd 1875, aged 70. A waste piece of land in front of these cottages, and on the street level was where wheelbarrows, etc., were parked. Around here was the shop of chemist William Fletcher – at 38 Bath Street — who in 1871 opened his new premises in Bath Street at the corner of Chapel Street and almost opposite his old shop. A road leading to the fields. 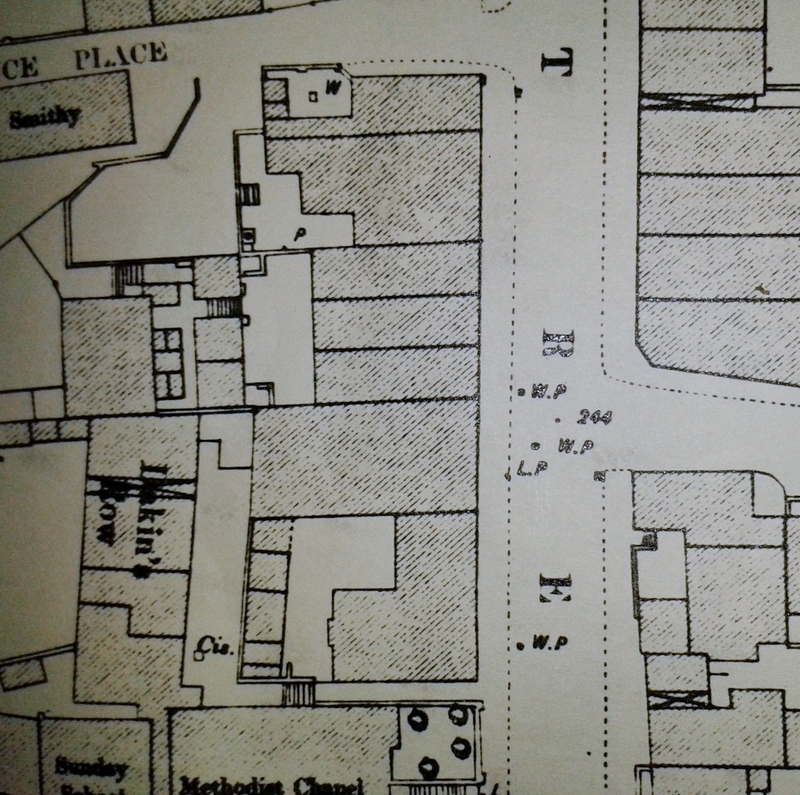 This would be in the area of what was later Providence Place, which you can see on the map above (c 1880), at the top left. We now continue to walk down Bath Street to Adcock’s Yard and meet the Calladines and Kellys.